An important topic to cover before delving in to your discussion of Islamic art is a brief history of the faith itself, explaining that—along with Judaism and Christianity—Islam is one of the world’s main monotheistic religions. As the youngest of the three, Islam conceives of itself as a universal culmination of the prophecies of these earlier religions, incorporating figures like Abraham and Jesus as early prophets. Showing an image of the Kaaba in Mecca introduces the importance of this site for Muslims. This will lead to a discussion on the orientation of important mosque features, such as the Mihrab that indicates the direction towards Mecca, which you will touch on later in more detail during your lecture. Next, ask the class what exactly the term “Islamic Art” might mean. Here, you can point out the temporal and geographic diversity of the materials that could be included in that phrase, which could be accompanied by more familiar images like the Dome of the Rock in Jerusalem (691CE) and the Taj Mahal in India (1632–53CE). With these, you can explain that Islamic Art is a modern concept created by art historians in the nineteenth century to categorize and study the material produced under the Islamic peoples that emerged from Arabia in the seventh century. By the time in the semester that you are covering Islamic Art and Architecture, it is likely that you’ve already discussed other forms of religious architecture, including ancient Greek and Roman temples or early Christian churches. This provides an excellent platform for considering what exactly it is that makes a space sacred, the intersection of art and ritual, and how a site is designed to meet the requirements of its faith. For example, you can ask your students to recall the key requirements of a church for Christian liturgy (e.g., aisles for procession, the altar for the Eucharist, large interior to accommodate a congregation) and relate this to the functionality of the architectural plan. In your lecture, you will highlight similar considerations of the requirements Islam imposes upon mosque architecture. Further, covering the influence of Roman architecture (evidenced in the arches, columns, and domes) will give the students an idea of how Islamic artists and architects interacted and exchanged with other cultures. The Kaaba, Mecca, date unknown. Both the Metropolitan Museum of Art and Smarthistory offer incredibly helpful online materials on Islamic Art. The Metropolitan Museum of Art’s Art of the Islamic World: A Resource for Educators includes seven units of materials covering topics such as “Islam and Religious Art,” “Arab Script and the Art of Calligraphy,” and “Geometric Design in Islamic Art.” Likewise, Smarthistory has an entire section devoted to “Arts of the Islamic World.” Here, you can find introductory essays covering the Islamic faith, as well as valuable writing explaining the common elements of mosque architecture. In addition, there are short articles and videos covering individual architectural sites and objects. In particular, Dr. Elizabeth Macaulay-Lewis’s “Introduction to the Arts of the Islamic World” does an excellent job of explaining what Islamic Art is and common themes that could be included in your course discussion. James Terry’s Timeline of the Islamic World is also a good source. By starting class with a map showing the spread of Islam, students can get an idea of the vast amount of time and geographical space covered in the discussion of Islamic Art. You can stress that, not only does this lecture cover a vast area of the world, but it also spans many important dynasties and cultures that will be introduced throughout the class. Selected works will familiarize students with important sites for Islam, such as Jerusalem, and influential historic courts like Córdoba in Spain. Great Mosque of Djenné, Djenné, Mali, 13th century CE (rebuilt 1907). Hajj: This Muslim pilgrimage to Mecca takes place in the last month of the year. All Muslims are expected to make this trip at least once during their lifetime. Kaaba: A square stone building in the center of the Great Mosque at Mecca, this is the most holy site in the Muslim faith. It stands on the site of a pre-Islamic shrine said to have been built by Abraham. Muslims worldwide are supposed to face in the direction of the Kaaba during prayer. Kufic: This early, angular form of the Arabic alphabet is found chiefly in decorative inscriptions. Mecca: The birthplace of the prophet Mohammad (570–632CE), Mecca is a city in modern-day western Saudi Arabia, considered by Muslims to be the holiest city of Islam. Mihrab: A niche in the wall of each mosque at the point nearest to Mecca, the congregation faces the mihrab to pray. Minaret: A tall slender tower, typically part of a mosque, a minaret contains a balcony from which a muezzin (defined below) calls Muslims to prayer. Qibla: the term for the direction of the Kaaba (the sacred building at Mecca), to which Muslims turn at prayer. The qibla is indicated in a mosque by the position of the mihrab. Qur’an: This Islamic sacred book is believed to be the word of God as dictated to Mohammad by the archangel Gabriel and written down in Arabic. 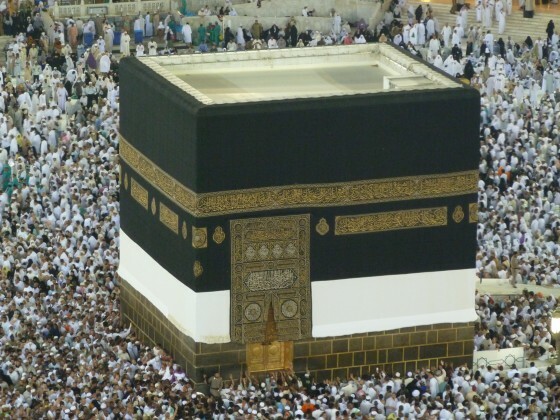 The Kaaba, located in Mecca, is a cubical structure approximately fifteen meters tall and ten meters on each size. It is a sacred site believed to have been built by Abraham. According to Islamic tradition, Mohammad found the structure filled with statues of pagan gods, which he disposed of, symbolically returning the shrine to the monotheism of Abraham. Additionally, the black cloth, or kiswa, was first used in the seventh century and is replaced annually during the hajj. The removal of the figurative polytheistic statues, as well as the use of the black cloth, has been interpreted by Muslims to mean that Mohammad did not approve of figuration. Therefore, the decoration seen on Muslim religious sites is aniconistic. Aniconism is the belief in avoiding images of divine beings, prophets, or other respected religious figures. The intricate decorations on the buildings and art works we discuss today will include arabesque geometric patters and calligraphic script rather than religious narratives. The Kaaba is perhaps the most sacred site in Islam and the central site of pilgrimage. In this time-lapse photograph, the blur around the Kaaba is created by the bodies of thousands of Muslims circumambulating (walking around) the structure in reverence. You might also point to the buildings in the background of the image for your students’ first look into Islamic architectural elements. Abd al-Malik commissioned the Dome of the Rock around the year 691 CE to mark the triumph of Islam in Jerusalem. The building is meant to display the power of the new faith. The shrine takes the form of an octagon with a towering dome and is considered the first great Islamic building. It was erected during the Umayyad dynasty, an important early Muslim dynasty that reached its peak of power during the reign of Abd al-Malik. From the outside, the building is iconic for its 75-foot-tall double-shelled gilt aluminum and bronze dome. Looking at the interior, the original mosaics are largely intact. Rather than figural representations of Biblical scenes common in Christian churches, the ornamentation here consists of beautiful calligraphy. The inscriptions include some of the earliest examples of verses from the Qur’an. Importantly, the building is located on a site sacred to Muslims, Christians, and Jews. At the center of the rotunda is a rocky outcropping that is associated with Adam, Abraham, and Mohammad. This is believed to be the site where the Hebrews built the Temple of Solomon, the location of Adam’s grave, the spot where Abraham prepared to sacrifice Isaac, and where Mohammad began his journey to Heaven. In this sense, the Dome of the Rock is a literal and physical transcription of the idea that Islam builds upon the earlier monotheistic religious. Further, the Dome of the Rock illustrates the Late Antique tradition of architecture of the Mediterranean world. The structure is descended from the Pantheon in Rome and the Hagia Sophia in Istanbul, through it more closely resembles octagonal San Vitale in Ravenna. Beyond Jerusalem, the descendants of the Umayyad dynasty later ruled most of Spain, Portugal, and a small section of Southern France. In Spain, the capital was in Córdoba, the location of the Great Mosque of Córdoba, which was built in the 8th–10th centuries CE. The mosque was constructed on the site of a former Christian church, previously a temple to the Roman god Janus. The complex includes a large hypostyle prayer hall (hypostyle meaning filled with columns), a courtyard with a fountain in the middle, an orange grove, a covered walkway circling the courtyard, and a minaret that is now encased in a squared, tapered bell tower. The large patio, marble columns, and capitals in the hypostyle prayer hall are all recycled both from the Christian church that formerly occupied the space, as well as from classical buildings in the region (the area was formerly a wealthy Roman province). The horseshoe arches were known from Roman times and later came to be associated with Islamic architecture in the West. In addition, the alternation of white and red brick was adopted from Roman and Byzantine precedents. The Great Mosque of Córdoba is an excellent example of how this architectural style is based on pre-existing regional traditions. The Qur’an is the sacred text of Islam, consisting of the divine revelation to the Prophet Mohammad in Arabic. The Qur’an Page (surah 47:36) from Syria, made in the 9th century CE, features black ink pigments and gold on vellum. Vellum is parchment made from animal skin. This Qur’an page exemplifies the common style from this period; the calligraphic style used by these early scribes is known today as Kufic script. Like most early Qur’ans, this page has large Kufic letters and only three to five horizontal lines per page. Visual clarity was a necessity, because multiple readers often shared one book simultaneously. Here, you can see how the red diacritical marks (pronunciation guides) accent the dark brown ink. In addition, the surah (or chapter) title is embedded in the burnished ornament at the bottom of the sheet. As seen in the religious architectural interiors, figural imagery such as human or animal forms was considered inappropriate. Instead, artists relied on vegetal and geometric motifs when they decorated sacred manuscripts. Calligraphers enjoyed the highest status of artists in Islamic societies. After long and arduous training, outstanding calligraphers even received public recognition. Towards the end of the medieval period, Kamal al-Din Bihzad made the painting titled Caliph Harun al-Rashid Visits the Turkish Bath, using ink and pigments on paper. The subject of the piece comes from the Khamsa (Five Poem) of Nizami. Bihzad was a leader in the Herat School, one of the great royal centers for miniature painting in western Afghanistan during the Timurid period (1370–1507 CE). The bathhouse (hammam), adapted from Roman and Hellenistic predecessors, became an important social center in much of the Islamic world. Hammams were frequently located near a mosque, where they were part of commercial complex that helped to generate income for the mosque’s upkeep. Scholars often note that this painting demonstrates Bihzad’s ability to render human activity convincingly. Here, the space is constructed through a complex, stage-like architectural setting. The space is stylized according to Timurid conventions, and the result is a visual balance between activity and architecture. The asymmetrical composition depends on careful placement of both colors and architectural ornaments within each section. Next, we move on to an important monument from the Ottoman Empire. The builder of this mosque, Sinan, is one of the most celebrated Islamic architects in all of history. Sinan was born a Christian, and later converted to Islam. During the Ottoman Empire, Sinan designed the Mosque of Sultan Selim in Edirne, Turkey, 1568–75 CE. The Ottomans developed a new type of mosque with a dome-covered square prayer hall. The plan features geometric clarity, a central design, and precise numerical ratios. Here, the dome is taller than the dome of the Hagia Sophia and was considered an engineering triumph at the time. From the exterior view, the dome is offset by four slender minarets. The interior is composed of a fusion of octagon- and dome-covered squares with four half-domes at the corners. For the Ottomans, the success of the Mosque of Selim was understood as proof that they had finally outshone the Christian emperors of Byzantium in the realm of architecture. From the late Middle Ages on, carpets and textiles were one of the best-known Islamic art forms in the West. Rugs are often used in Muslim prayer, which involves kneeling and touching the forehead to the floor. In addition to individuals owning their own small-sized rugs, mosques were also furnished with large rugs, often acquired as pious donations. A famous example is the Ardabil Carpet (1540 CE). The Ardabil Carpet was made for the funerary mosque of Shaykh Safi al-Din but dates from two centuries after construction of the mosque. Originally, two carpets were created. When they came to the Victoria & Albert Museum in London in the nineteenth century, the carpets were in poor shape, and the museum decided to sacrifice one carpet in order to restore the other. This was accomplished by taking parts from one carpet to supplement the lacks in the other. It is the world’s oldest dated carpet and is considered by many historians to be the largest, most beautiful and historically important carpet in the world. The size is about 35′ by 18′ long, and it required roughly 25 million knots to construct. The design of the carpet features a central sunburst medallion that represents the illusion of a heavenly dome. There are also mosque lamps that are reflected in a pool of water filled with floating lotus blossoms. You will notice that there are no humans or animals depicted, since this was used in a mosque, though they did appear on secular textiles from that period. The name Maqsud of Kasham appears as part of the carpet’s design. He was likely the artist who supplied the master pattern for the Ardabil Carpet. The Taj Mahal is an important architectural work in India. The Taj Mahal was built in Agra between 1632 and 1647 CE. It is a Mughal dynasty mausoleum that seems to float magically over the reflecting pools that lay before it in a vast surrounding garden. Monumental tombs are not part of Hindu or Buddhist traditions, traditionally the major religions in India, but they do have a long history in Islamic architecture. Thus, the Taj Mahal demonstrates the influence of the Islamic Mughal dynasty in India. Shah Jahan commissioned the Taj Mahal in memorial to his favorite wife, Mumtaz Mahal. The site eventually became his tomb as well. Here, you can see the dome-on-cube shape from other Islamic buildings (such as the Mosque of Sultan Selim, above); modifications and refinement make it a seemingly weightless vision of white marble. Stairways up the platform are hidden from view, which emphasizes that feeling of weightlessness or floating. A contemporary court historian described the Taj Mahal’s minarets as ladders reaching towards heaven. The architect who designed the Taj Mahal used an all-encompassing system of proportions: it is as wide as it is tall, and the height of its dome is equal to the height of its façade. As the Islamic faith spread, so did the necessity for Islamic architecture to house it. The Great Friday Mosque, in Djenné, Mali, was originally constructed in the 13th century CE and later rebuilt in 1907. This building resembles Middle Eastern mosques in plan (including the large courtyard in front of a roofed prayer hall); however, the construction materials, adobe and wood, are distinctly African. The Great Friday Mosque is one of the most ambitious examples of adobe architecture. Adobe is a building material, here formed into sundried mud bricks. The façade is unusual for a mosque. There are soaring adobe towers, and vertical buttresses resembling engaged columns produce a visual rhythm on the exterior. The numerous rows of protruding wooden beams enliven the design, and also serve as practical perches for workers when recoating the clay during an annual community religious festival. Islam rapidly spread east and west from the Middle East into both India and Spain. Despite these geographic contrasts, what features do mosques typically have in common? Select an Islamic structure discussed in this section that is influenced by Roman and/or Byzantine construction, and note which forms are borrowed. How, in their new Islamic context, are they transformed? As an aniconistic religion, Islamic art has no images of people in religious contexts. Instead, what decorative motifs and techniques are used? Leila Anne Harris (author) is a PhD student at the CUNY Graduate Center.